Rishabh Java is a 16-year-old boy with a love for making things, some to help other people and some just to make him look cool. He started making things when he was 7 after being inspired by a Hindi movie on robots. A few projects he has worked on recently that he is particularly proud about include a low-cost 3D printed mind or voice-controlled bionic arm that is being used by an amputee in India, a six-feet tall humanoid robot, a range of mind-controlled toys intended as a futuristic method of treating ADHD and a virtual presence robot. 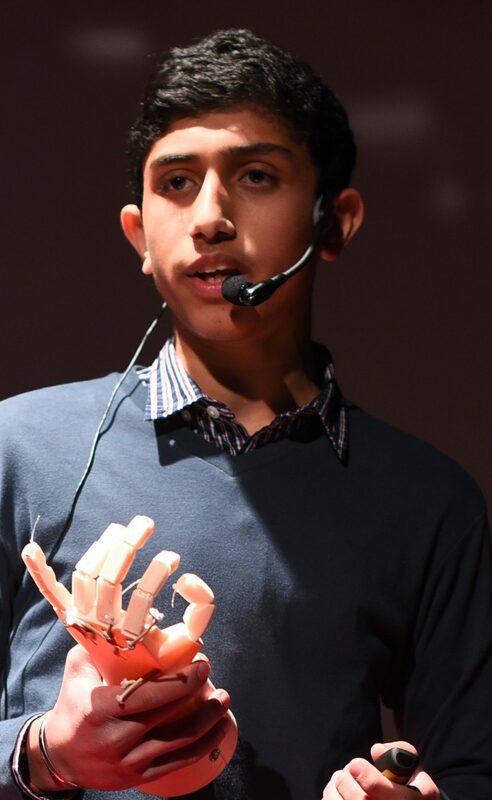 He has won awards at competitions for his projects such as the 2 top prizes at the Gulf 3D printing Olympiad, 1st at the World 3D Printing Olympiad, Best Presentation award at a Young Scientist Award, and was the Grade Prize winner at a Business Challenge. He has also conducted workshops on the basics of Arduino for school students and workshops on making mind-controlled toys for people of all ages. Rishabh was a speaker at Campus Party in Singapore, has given a TED talk about his project, is a content creator for Interchange, Singex and has moderated Kitchen table discussions at IoT Asia in Singapore. Singex invited him to their expos where he distils industry level presentations into short videos understandable by school students. He has also successfully funded a crowd-funding campaign to raise money for a project he wanted to start research on.